When Brussels sprout lovers find out I dislike these little, cute cabbage balls their first response is, “Well you have to try my recipe!” Have you ever encountered this? I use to hear this about sweet potatoes also and one day I actually found a sweet potato I liked. The easiest recipe ever, baked with butter on top. Turns out the only way I had ever tried them was with that marshmallow crap on top at Thanksgiving. Since figuring that out I haven’t come a sweet potato I won’t eat. For that reason I always listen to the people who tell me their recipe is something special and try it out. Until today I have only tried a few variations where I am able to eat more than a couple of bites and they usually are made with balsamic. Oh yeah, and roasted so they are slightly crispy. Despite the fact that I don’t care for them I couldn’t help but being in awe when Brussels sprout stalks become available. They are so frickin’ beautiful! They make me want to like them. Last week Hubby and I saw them at the store and I pointed out how pretty they looked. He then mentioned that he actually liked them so I broke out of my comfort zone and decided to get them. 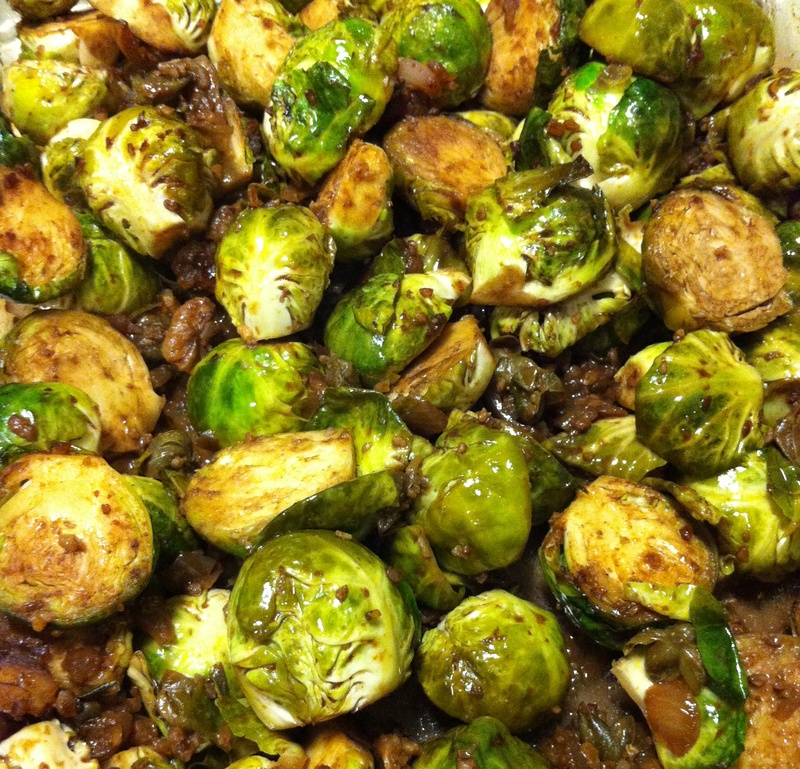 If you have a link to a great Brussels Sprouts recipe please share! As a kid I told my dad that I though Brussels sprouts tasted like metal. He always thought I was silly. As an adult they still do unless they have vinegar in the mix. Turns out I am not crazy and if you don’t taste the bitter, metallic taste it is genetic. My dad heard this on one of his nerdy science shows and actually apologized for calling me crazy all those years. Read more here. Now for the recipe. One thing I would like to note is that though I included no mustard of any kind it has a distinct Dijon mustard flavor. I really enjoyed these hot but I liked them even more the next day cold. 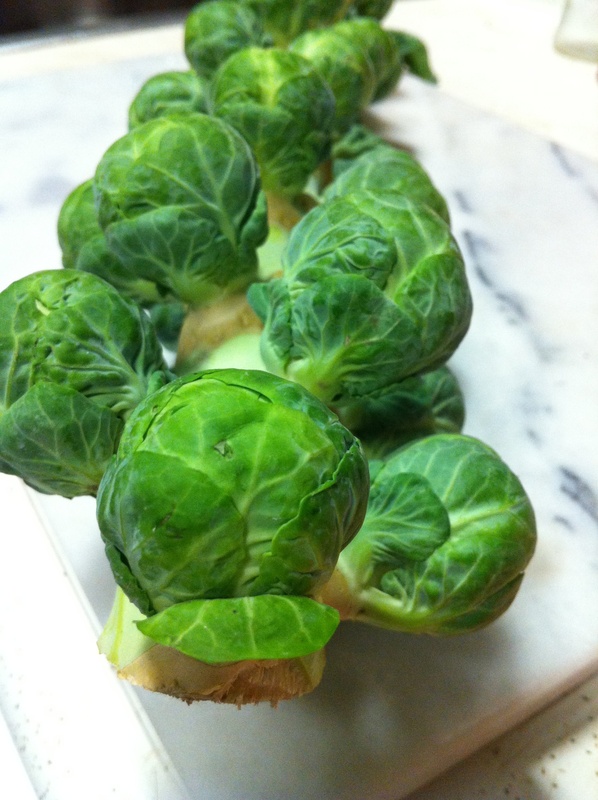 Break or cut the Brussels Sprouts off the stalk. Remove the outer leaves and cut in half. Set aside. In a food processor with an S blade process pecans so they look like crumbs. In a large skillet saute pecans and shallots in oil for five minutes. Add paprika, tamari, syrup, nutritional yeast, and capers and cook for three more minutes. Add sprouts and cook until lightly browned. Transfer Brussels sprouts mixture to a casserole dish. Stir in balsamic vinegar. Bake for twenty to thirty minutes (depending on how soft you want them) stirring half way through cooking time. Enjoy! Gallery | This entry was posted in An Ode to Vegan Bloggers MOFO 2012, Gluten Free, Sides. Bookmark the permalink. Sounds tasty. I’ve been really into brussels sprouts lately. I’ve noticed the mustard flavor in mine, too. Ahh…so maybe it is the sprout itself. Yum! I will have to try this recipe. sounds good! i hated brussel sprouts as i kid from the one time that my mom made them. but my mom isn’t exactly the world’s greatest cook, and hers came out of a frozen brick. last year i gave them a try, and thought they were fantastic roasted and crisped. Glad you found a way to enjoy them! Hope you enjoy the coconutty brussels sprouts! I seriously have the weirdest cravings for them in the winter. I don’t know what it is, my parents hate them (my mom doesn’t even like me cooking them in her presence, because she hates the smell so much) so I didn’t grow up eating them, but I could eat them on a daily basis once the weather turns cold. I also like to roast them with a bit of maple syrup and dijon mustard. Oh, maple syrup sounds good too!